Hey, hey, you shopaholics! 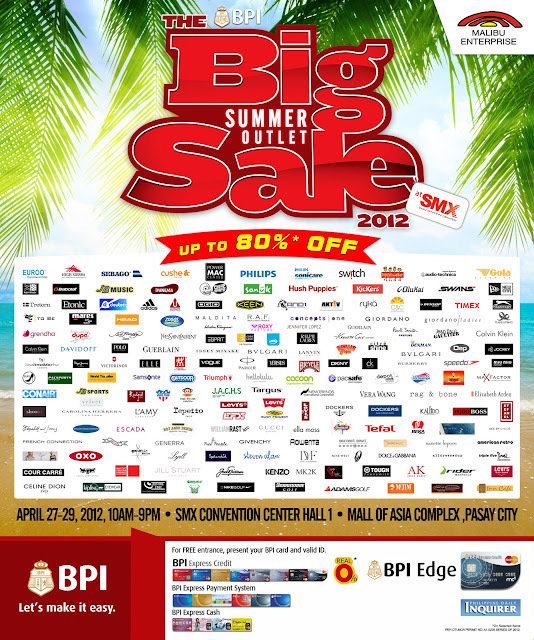 It's that time of the year for one the grandest sale events in Manila - The Big Summer Outlet Sale 2012 - organized by Malibu Enterprises in partnership with BPI Express Credit Edge and The Philippine Daily Inquirer. This summer, get some of your wanted items from different brands at up to 80% off! Just look at those brands down there - a lot of 'em! I've been attending The Big Outlet Sale for several times and I always go home with at least a thing with me (take note of "at least")! The Big Summer Outlet Sale 2012 happens on April 27-29, 2012 (Friday-Sunday) from 10AM to 9PM at the SMX Convention Center, Hall 1, Mall of Asia Complex, Pasay City. Entrance is absolutely FREE only to all BPI Cardholders (that includes credit cards, ATM cards, express cash cards). Just present your BPI card and a valid ID upon entrance. If you're not a BPI cardholder, you can still enter for a minimum fee of Php50.00. But wait! Why pay when you can enter for free? The first 50 commenters will get 2 tickets each to enter for free! Please join only once. You can join in two ways, but only choose ONE. 'Like' the Facebook Pages of Glich's Life and The Big Outlet Sale. Please make sure your privacy settings are set to Public, the link to this post is included or clickable, and you tag The Big Outlet Sale and Glich's Life Facebook Pages. Please make sure your privacy settings are set to Public. Comment below with your Full Name (as seen in a valid ID), E-mail Address, Direct Link to either your Facebook Wall Post OR Twitter Update. Giveaway is open from today until 11:59PM of April 25, 2012. Please don't join if you don't intend to go, so slots will not be wasted. wardrobe shopping before going aboad!!!! !